Mr.Sriram Tirunantalwan, Divisional Manager-Business Development, Ashok Leyland, Dr.GVN Prasad, Vice President, EHVT-Product Development, Ashok Leyland, Mr.Karthick Athmanathan, Head, Electric Vehicles and e-Mobility Solutions, Ashok Leyland, Prof. Bhaskar Ramamurthi, Director, IIT-Madras, Prof. Ashok Jhunjhunwala, Professor, IIT-Madras and Principal Advisor, Ministries of Power and New and Renewable Energy, Government of India, Dr.Prabhjot Kaur,CoBE, IIT-Madras, Mr.R. Nagarajan, Dean, International and Alumni Relations, IIT-Madras and Prof. Devendra Jalihal, Head, Department of Electrical Engineering, IIT-Madras. 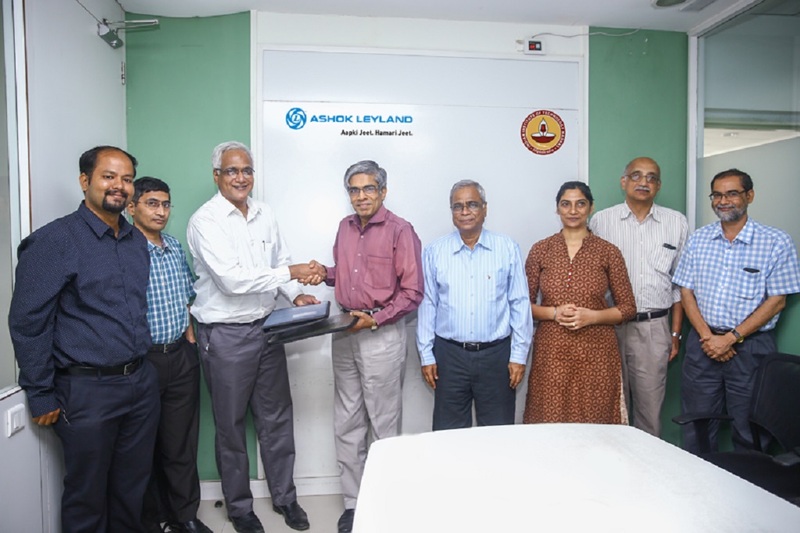 22nd August, 2017, Chennai: Ashok Leyland, flagship of the Hinduja Group, and Indian Institute of Technology Madras (IIT Madras) signed a Memorandum of Understanding (MOU), on 19th August 2017, for Ashok Leyland to sponsor the Centre of Battery Engineering (CoBE) at IIT Madras. The CoBE will seek to supplement the on-going research by facilitating collaboration between industry and researchers, which is currently lacking, to study various battery characteristics that are not completely understood even among Global players. IIT Madras has a great track record of working with industry leaders and innovators. The institution has come up with solutions which are business worthy and helps take the technological capability of the industry a step further. For Ashok Leyland, being a part of the CoBE is a very significant step in its journey and it has the potential to help the company understand battery technology as it proliferates the market with its Electric Vehicles with different architectures for different applications. In addition to joining the panel of sponsors of CoBE, Ashok Leyland is also keen on carrying out a fair amount of confidential consulting research projects with CoBE over the next few years. This will not only help the company evolve as a competitive player and India-optimised solutions provider for its customers but also help realising its ambition to stay ahead of global practices in this domain as the fourth largest Bus Maker in the world. CoBE will work towards understanding various battery issues and challenges in various areas of applications. It will also undertake high quality research projects to overcome these challenges. It will focus on the physics part of the battery technology as against other research units working on newer chemistries of the batteries. CoBE will target to work upon Battery Engineering and thorough characterisation of batteries via detailed testing, optimising battery performance for different applications and work towards better economics. CoBE will collaborate with various cell manufacturers from across the world, procure cells and characterise them to create a knowledge centre on available cells, providing industry with valuable data to select appropriate solutions. Additionally, CoBE will play a larger role of coordinating synergy among various industry partners to develop a holistic cooperation model across entire value chain of EV Batteries. It will also be doing consulting for Ashok Leyland as well as others in niche and IPR-intensive areas where there is a need for in-depth testing and development, including simulations. 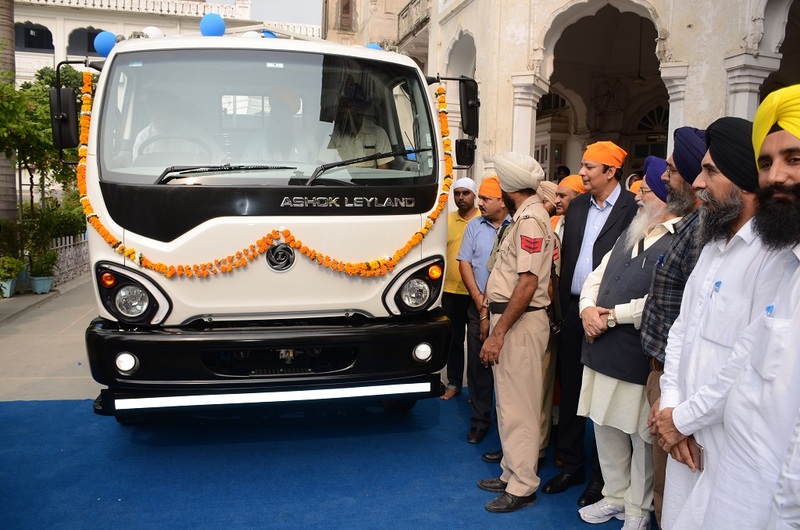 Through this partnership, Ashok Leyland aims to support the EV ecosystem at a national level to bring the industry up to speed considering the limited skills in the country as on date. Indian Institute of Technology Madras (IITM) was established in 1959 by the Government of India as an Institute of national importance. The activities of the Institute in various fields of Technology and Science are carried out in 16 academic departments and several advanced interdisciplinary Research Academic Centres. The Institute offers undergraduate and post – graduate programmes leading to the B.Tech., M.Sc., M.B.A., M.Tech., M.S., and Ph.D., degrees in a variety of specialisations. IITM is a residential institute with more than 550 faculty and 9000 students. Students from 18 countries are enrolled here. The campus is self-contained and is located on a beautiful wooded area of about 250 hectares. IITM fosters an active entrepreneurial culture with strong curricular support and through the IITM Incubation Cell (www.incubation.iitm.ac.in).